Management scholars, practitioners, and policy makers alike have sought to develop a deeper understanding of recent business crises—including corporate scandals, the collapse of financial institutions, and deep recession—in order to prevent their recurrence. Among the “culprits” that have been identified is Conventional management theory based upon a moral-point-of-view founded on assumptions of materialism and individualism. There have been calls to move beyond the dominant profit maximization paradigm and think about other, potentially more compelling, corporate objectives (Hamel, 2009). In this article, we respond to those calls, and seek to develop what we call Radical resource-based theory (RBT), which draws from and contrasts with the highly-influential Conventional RBT. Radical RBT defines the value of resources more broadly than profit maximization, rarity as an occasion for stewardship, inimitability as an opportunity for teaching, and non-substitutability as an opportunity to meet a panoply of human needs. This augmentation of RBT promises to help managers and scholars address a myriad of problems that are insoluble under Conventional assumptions. More generally, it shows the value of broadening management theory to a radical perspective by relaxing assumptions of self-interest and materialism. 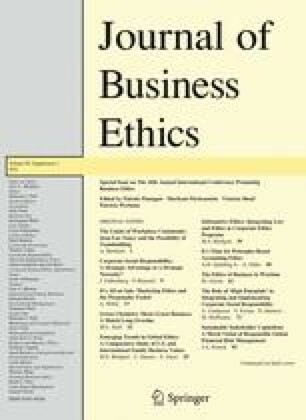 An earlier draft of this article was presented at the Sixteenth Annual International Conference Promoting Business Ethics held in Niagara Falls, NY in October 2009. We thank the participants of the Ethics Conference and Dr. Reg Litz for their encouragement and helpful comments. New American Dream. (2004). More of what matters survey report. www.newdream.org/about/poll.php.